Hummingbird Rescue and Care. About First-Aid. Hummingbird rescue is not an easy task. There are many dangers to hummingbirds from both nature and humans. It can be a heart-wrenching emotional experience for us when we encounter this tiny and fragile bird sick, injured, stunned, or trapped. Of course we wish to help. Read this page of information all the way through and gain some understanding of how to rescue a hummingbird and what is necessary. 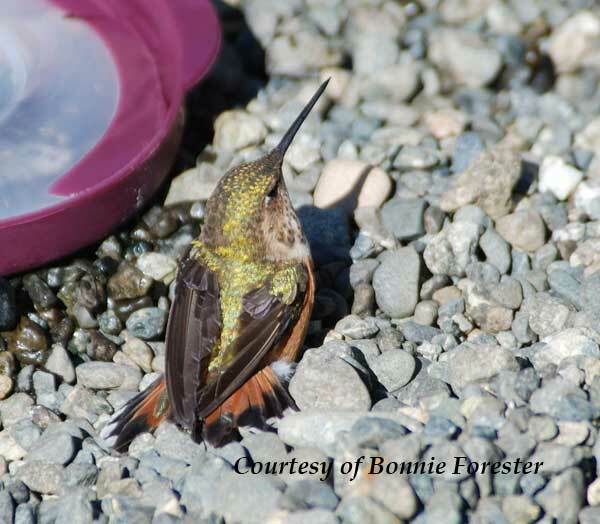 Know the Do's and Don'ts of "Hummingbird Rescue". In simple circumstances, with some knowledge, you may be able to help. In all situations, we always recommend contacting a Wildlife Rehabilitator. Hummingbirds are different than other birds. They live on the edge of survival and have special complex requirements. For example a hummingbird needs to eat constantly due to an exceptionally fast metabolism. Your timeline for rescue is as short as several hours. A Wildlife Rehabilitator can help in several ways. You may be able to transport the little bird to the facility where trained professionals have equipment, special cages and food to rehabilitate the hummingbird. If you use a cell phone, they can often offer help in a conversation. We advise that you take a picture to aide them even further. You know the old saying that a picture is worth a thousand words. The Wildlife Rehabilitation Information Directory has a list by state and county. Click here for the website. Of course, you can look in your phone book Yellow Pages to see if you can find a listing for a local listing. We suggest that you find a Wildlife Rehabilitator or professional today. Why wait until an emergency arises. You can be ready and prepared. 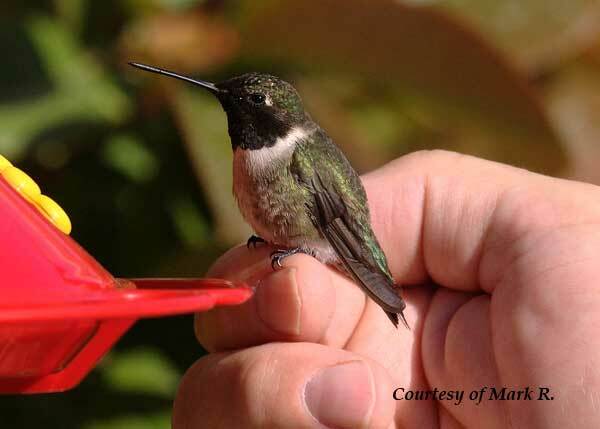 Please note that not all Wildlife Rehabilitators will be able to care for hummingbirds. So simply ask them if they can. Possibly they can direct you to someone who can help. You don’t want to be sorting all this out during an emergency. If a hummingbird wanders into any structure, do not open windows and doors in the hope that it will fly out. This will not work because a hummingbird doesn’t understand that light is coming in and that is the way out. Instead, it will probably fly upwards towards the ceiling like it does in nature to get around branches. Hummingbird Rescue Solution: Make the room or enclosed space as dark as possible. If the hummingbird cannot see, it will drop to the floor or a lower space. Now you can use a flashlight to try to find it. You can then use your hand to gently pick it up and release it outside. What happens if you cannot darken the room? Solution: The tactic that works best for this situation is to get a hummingbird feeder. Put the feeder on a broom handle or large stick and very slowly place it near the open door outside of the building. Have Patience!!! The bird will need to feed in a short while and will become attracted to the feeder. Quickly close the door when it is outside. Prevention: Remember that hummingbirds are attracted to red. So look for what might be attracting them such as red door knobs or window boxes with brightly colored flowers. Keep doors and windows without screens closed. What To Do When a Hummingbird Flies Into a Window. Although somewhat rare because of amazing flight capabilities, a hummingbird can fly into a window and become stunned or worse. Possibly a fight with another hummingbird might also leave them in this state. In this case, if you are picking up a hummingbird be sure to keep your hands as close to the ground as possible. This stunned bird might suddenly recover and decide to fly away. Remember that it will be a little disoriented and you don’t want it to harm itself in any way. If it doesn’t wake up right away, check it for injury. You can offer it some nectar while it is restoring its wits. Remember not to force the nectar. Solution: Use "Window Decals" to prevent hummingbirds from crashing into the glass of windows and doors. A window decal is a static-cling material that may be applied to windows and doors. The decal contains a component which brilliantly reflects ultraviolet sunlight. 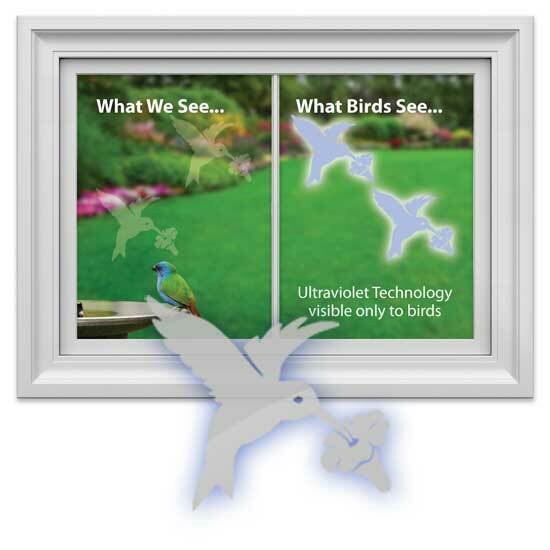 This ultraviolet light is invisible to humans, but glows like a stoplight for birds. These decals help birds see windows and thus avoid striking the glass. Hummingbird Rescue in a Cold Spell. Hummingbirds have a special adaptation for cold spells. They go into a semi-hibernation like state called Torpor. Torpor slows down their metabolism and allows them to live. They appear listless in morning and are slow to come out Torpor. You can help by hanging several feeders full of fresh nectar outdoors. Store other feeders in the heat of the indoors and interchange them when you notice the outside feeders starting to freeze. After dark, bring all feeders indoors for the night and return the feeders outside early in the morning. Hummingbirds are very early risers. We have photos of hummingbirds visiting our feeders before daylight. However, prolonged cold spells can be a danger to hummingbirds. If you have concern call the Wildlife Rehabilitator. Visit our page about when to take down a hummingbird feeder for more advice on how to keep the nectar from freezing. I Don't Feel So Good Today! Hummingbird Rescue of a Sick/Injured Hummingbird. Hummingbirds can get sick. They are vulnerable to a whole range of viruses, bacteria, parasites, and fungi. If, for example, you see a wart-like growth on the legs or the head, that is probably caused by a virus. 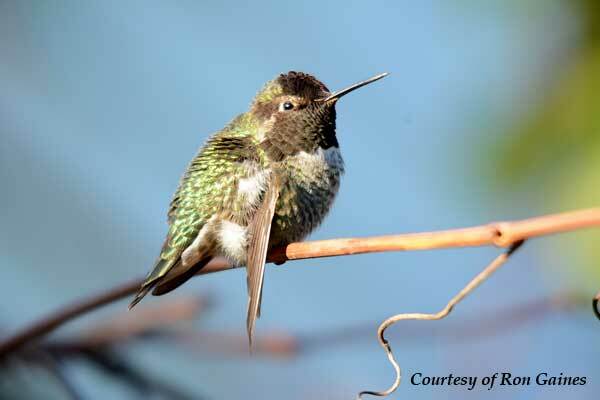 Hummingbirds can get sick from visiting feeders that are poorly maintained. Honey used in a feeder can cause candidiasis, a fungus of the palate. In these situations, it is best to contact a wildlife rehabilitator. If one cannot be reached or it will take some time for them to arrive, you might need to feed the hummingbird. Okay. So yes it can be a challenge to feed an injured or sick hummingbird. Mix a batch of hummingbird nectar. If you have super clean eyedropper on hand use that. It must be super clean! Click here for a nectar recipe. 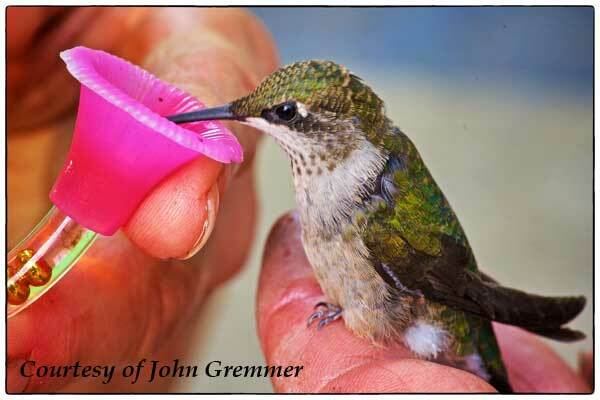 If the hummingbird is weak, you can pour a small amount into you cupped hands. Put the hummingbird’s bill near your hand but not in it. See if the hummingbird starts to eat. If the hummingbird seems strong enough you can use a feeder. Again put the hummingbird near the feeder. Do not force the beak into the feeding port. Hopefully the bird will eat on its own. If not, it is fine to try again in a few minutes. You must know that you cannot totally rehabilitate the hummingbird with just nectar. It also needs protein from insects. Do not try to feed any insects to a hummingbird. Their digestive system is not equipped to digest all insects. You can do more harm than good. How to Prevent an Accident or Illness. Place hummingbirds out of sight of one another to give them ample feeding territory. Unless you have only one or a small number of hummingbirds, it is better to hang more feeders. There will always be some territorial fighting but you can help cut down on the amount if you are providing sufficient habitat. 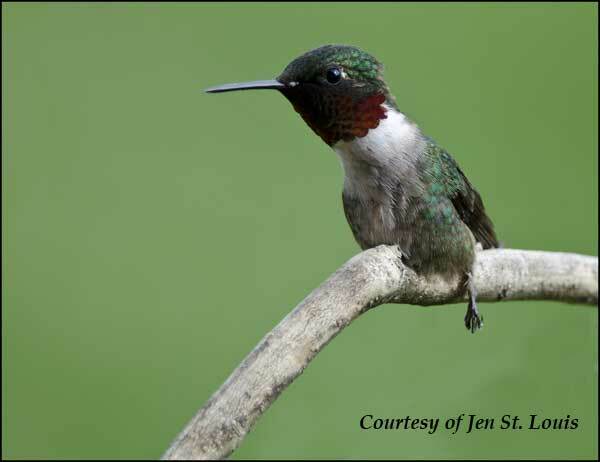 Many pathogens that affect hummingbirds come from nature. Nonetheless, always keep your feeders clean and well maintained. Only supply nectar that is a simple sugar water ratio. Never use red dye which can make hummingbird sick. What to do if you find an occupied nest on the ground? If a baby hummingbird falls out of its nest before it can fly, you can gently pick it and return it to its nest. There is a belief about all baby birds that if touched by a human the mother will desert them. This is not true about hummingbirds who do not have a sense of smell. Hummingbird nests are particularly vulnerable to threats. A nest might be blown down by a large wind storm or a branch might break entirely in a hurricane. Humans may inadvertently chop down a tree containing a nest. Suppose you find an occupied nest on the ground. If you know where the hummingbird nest came from, it’s fine to gently place it back in the original location. Watch the nest for a while. The mother should come back to feed within 15 minutes. Many times this is not possible because the branch is gone or you simply do not know the exact branch the nest came from. Possibly the nest is broken with eggs or live babies inside. 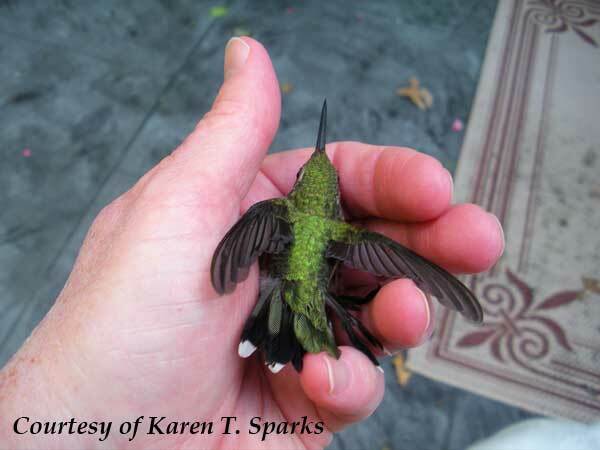 Hummingbird Rescue Solution: – Call the Wildlife Rehabilitator immediately. Baby hummingbirds cannot adjust their own body temperature. Don’t take them inside to care for them. What To Do If You Think There is An Abandoned Nest. First, it is important to know that a hummingbird mother will only sit on a nest for approximately 9 to 12 days. After that, she will perch on a nearby branch. If you are watching a nest, believing the nest may have been abandoned and the babies are in need of a helping hand, be careful. Watch the nest for a while. The mother should return several times every hour to feed her babies. If she does not, the nest might be abandoned. Another indicator would be to hear the chicks chirping heartedly. This is not normal for hummingbird chick who generally stay peep quiet to prevent predators from finding them. 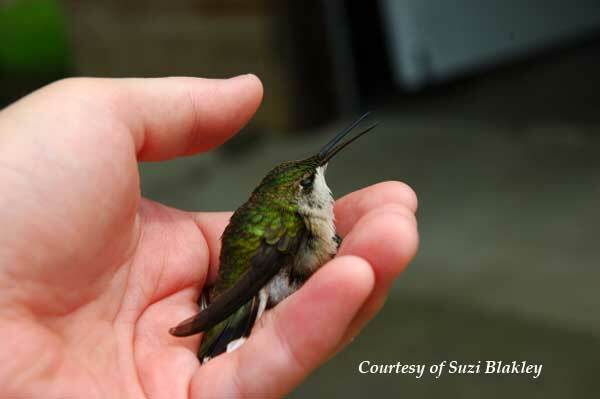 This is the time to call the Wildlife Rehabilitator for a hummingbird rescue. If one cannot be found, you can attempt to feed the chicks with an eyedropper. Give them about 3 drops every half hour. BABY HUMMINGBIRDS CANNOT REGULATE THEIR BODY TEMPERATURE, so please continue to try to get in touch with a Wildlife Rehabilitator. These babies need a lot more than nectar. Although we love them because they are our friends. They return to our feeders every year and can be very friendly, hummingbirds are wild birds. Never keep a hummingbird as a pet! Some people, as well-meaning as they are, believe that they should rehabilitate a hummingbird by keeping it in their home. A hummingbird has complex needs and won’t live long in captivity. In the Unites States it is against the law/illegal to hold a hummingbird, a hummingbird nest, a hummingbird baby, or any part of a hummingbird, nest, or egg, in any type of captivity. We repeat: unless you have a valid permit, it is illegal to trap, band, hold, harass, or control any hummingbird or any part of the hummingbird, nest, or egg. Please note that this law does not apply to any simple hummingbird rescue. That is, it is fine to touch them and attempt to feed. Never keep a hummingbird after that. Violation of this law can result in a fine of between $15,000 and $200,000 US. We cannot rescue every hummingbird. Our love for them makes it sad when even one is lost to us.